Editor’s Note: The reader should note that this article contains some quotations taken from old English whose spelling is quite different from our modern counterpart. The skills of grappling and the art of wrestling have a long legacy in Europe. In the early 1500s, many soldiers, scholars, priests, and nobles wrote that wrestling was important in preparing aristocratic youth for military service. 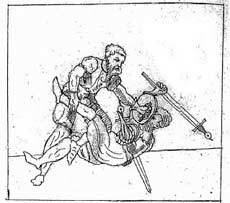 The detailed depictions of unarmed techniques in many Medieval fencing manuals (such as those by Fiore Dei Liberi and Hans Talhoffer) are well known and accounts of wrestling and grappling abound in descriptions of 15th century tournaments and judicial contests. A 1442 tournament fight in Paris "with weapons as we are accustomed to carrying in battle" included in its fourth article the stipulation "that each of us may help each other with wrestling, using legs, feet, arms or hands." English knightly tournaments as late as 1507 allowed combatants "To Wrestle all maner of wayes" or to fight "with Gripe, or otherwise". 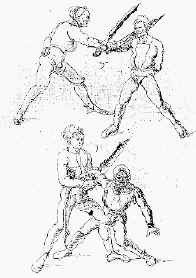 The Hispano-Italian master Pietro Monte in the 1480’s even recognized wrestling as the "foundation of all fighting", armed or unarmed. Albrecht Duerer’s Fechtbuch of 1512 contains more material on wrestling than on swordplay, yet the relationship between them is noticeable. The oldest known fencing text, the late 13th century treatise MS I.33, even states, "For when one will not cede to the other, but they press one against the other and rush close, there is almost no use for arms, especially long ones, but grappling begins, where each seeks to throw down the other or cast him on the ground, and to harm and overcome him with many other means." But just how all this heritage relates to the foyning fence of the Renaissance is less well understood. This has been an area traditionally overlooked by enthusiasts and it is understandable that many enthusiasts have come to the wrong conclusions. 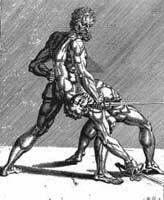 Nonetheless, all historical armed combat (Medieval and Renaissance, cutting or thrusting) involved some degree of grappling and wrestling techniques. But, as few Renaissance fencing manuals include detailed sections on grappling and wrestling or even discuss seizures and disarms, the popular view has been that they were not used or were viewed with disdain. Besides, aren’t unarmed and pugilistic attacks merely unskilled "thuggery" practiced only by the lower classes? After all, surely one should not need to wrestle if one knows the sword "to perfection"? (…and yet how many are "perfect" with their sword, we might ask?). This common view makes perfect sense, after all, as a slender cut-and-thrust sword or rapier is a weapon whose characteristics are perfectly suited to keeping an opponent off and killing him at range. Intentionally closing-in to resort to hands-on brute strength would seem antithetical to the very nature and advantage of the weapon. In actuality, the matter is that such actions were not primitive, but advanced techniques that required considerable practice and skill to execute –and knowing them could make a fighter a more well-rounded and dangerous opponent in combat. Yet, fencing historians have typically seen these advanced techniques as being crudities and mere "tricks". Part of this prejudice perhaps stems from the surviving 18th & 19th century view of swordplay as being essentially that of personal "duel of honor" or gentlemanly private quarrel. The traditional focus there has been on fencing as "blade on blade" action rather than on "fighting" with swords in battle or sudden urban assault. This was not the case in the 1500’s and 1600’s. Armed fighting ranged from all manner of encounters with all manner of bladed weapons. Yet, because approval of grappling and wrestling in the period was inconsistent and often curtailed during fencing practice, understanding its true value can be confusing now for students unfamiliar with either the actual evidence or the actual techniques. In the early 1500’s the Italian solider-priest Celio Calacagnini listed wrestling as an exercise required for preparing upper-class youths for military service. In 1528, the courtier Baldassare Castiglione wrote, " it is of the highest importance to know how to wrestle, since this often accompanies combat on foot." In 1531 the English scholar and diplomat Sir Thomas Elyot wrote, "There be divers maners of wrastlinges" and "undoubtedly it shall be founde profitable in warres, in case that a capitayne shall be constrayned to cope with his aduersary hande to hande, hauyng his weapon broken or loste. Also it hath ben sene that the waiker persone, by the sleight of wrastlyng, hath ouerthrowen the strenger, almost or he coulde fasten on the other any violent stroke." In 1575, Michel de Montaigne, the French Renaissance thinker, essayist, and courtier, wrote "our very exercises and recreations, running, wrestling …and fencing". 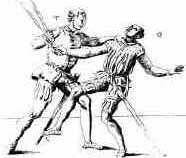 In the notorious 1547 duel between the nobles Jarnac and Chastaignerai, Jarnac was so concerned at Chastaignerai’s well known skill as a wrestler (not to mention fencing) that to avoid the chance of a close struggle, he insisted both parties each wear two daggers. Alfred Hutton’s account from Vulson de la Colombière’s in 1549 of a judicial combat between one D’aguerre and Fendilles states, "D’aguerre let fall his sword, and being an expert wrestler (for be it understood that no one in those days was considered a complete man-at-arms unless he was proficient in the wrestling art), threw his enemy, held him down, and, having disarmed him of his morion, dealt him many severe blows on the head and face with it…". A Ritterakedemie or "Knight’s School" was reportedly set up in 1589 at Tübingen in Germany to instruct aristocratic youths in skills which included wrestling, fencing, riding, dancing, tennis, and firearms. Joachim Meyer offered significant elements of grappling and wrestling with swords in his Fechtbuch of 1570 and in the 1580’s the French general Francois de la Noue advocated wrestling in the curriculum of military academies and the famed chronicler of duels, Brantome, also tells us that wrestling was highly regarded at the French court. The Bolognese master, Lelio de Tedeschi, even produced a manual on the art of disarming in 1603. In 1625, Englishman Richard Peeke fought in a rapier duel at Cadiz, defeating the Spaniard Tiago by sweeping his legs out from under him after trapping his blade with his hilt. In 1617 Joseph Swetnam commented on the value of skill in wrestling for staff fighting. But as Dr. Anglo has pointed out, in 1622, Englishman Henry Peacham questioned whether "throwing and wrestling" were more befitting common soldiers rather than nobility, while his contemporary Lord Herbert of Cherbury who studied martial arts in France, found them "qualities of great use". At the turn of the 17th century in France, the celebrated rapier duelists Lagarde and Bazanez came into conflict (the celebrated "duel of the hat") and ended up on the ground violently stabbing and fighting each other. There is evidence close-in techniques were excluded from the German Fechtschulen events of the 1500s where, in order to perform safe displays, rules were in place to prevent such techniques. Similarly, the 1573 Sloane manuscript of the London Masters of Defence states that in Prize Playing events "who soever dothe play agaynst ye prizor, and doth strike his blowe and close withall so that the prizor cannot strike his blowe after agayne, shall Wynn no game for anny Veneye". The implication in such cases is that while closing and seizing is effective and understood, it is inappropriate for the public display intended to show a student’s skill at defending and delivering blows. In 1579, Heinrich Von Gunterrodt noted that "Fencing is a worthy, manly, and most noble Gymnastic art, established by principles of nature…which serves both gladiator and soldier, indeed everyone, in …battles, and single-combats, with every hand-to-hand weapon, and also wrestling, for strongly defending, and achieving victory over." Von Gunterrodt, also observed: in fencing, "when one will not cede to the other, but they press one against the other and rush close, there is almost no use for arms, especially long ones, but grappling begins, where each seeks to throw down the other or cast him on the ground, and to harm and overcome him with many other means." "When two valiant men of skill at single rapier do fight, one or both of them most commonly standing upon their strength or skill in wrestling, will presently seek to run into the close…But happening both of one mind, they rather do bring themselves together. That being done, no skill with rapiers avail, they presently grapple fast their hilts, their wrists, arms, bodies or necks, as in …wrestling, or striving together, they may best find for their advantages. Whereby it most commonly false out, that he that is the best wrestler, or strongest man (if neither of them can wrestle) overcomes, wrestling by strength, or fine skill in wrestling, the rapier from his adversary, or casting him from him, wither to the ground, or to such distance, that he may by reason thereof, use the edge or point of his rapier, to strike or thrust him, leaving him dead or alive at his mercy." "When two unskillful men (being valiant) shall fight with long single rapiers, there is less danger in that kind of fight, by reason of their distance in convenient length, weight, and unwieldiness, than is with short rapiers, whereby it comes to pass, that what hurt shall happen to be done, if any with the edge or point of their rapiers is done in a moment, and presently will grapple and wrestle together, wherein most commonly the strongest or best wrestler overcomes, and the like fight falls out between them, at the long rapier and poniard, but much more deadly, because instead of close and wresting, they fall most commonly to stabbing with their poniards." Of course, some might argue Silver was not a "rapier master" and so did not understand "proper" fencing. Regardless, he was obviously an experience, highly skilled martial artist and expert swordsman who had seen valid methods of rapier fighting in actual use. Then there is the case of "Austin Bagger, a very tall gentleman of his hands, not standing much upon his skill" who Silver describes as having with his sword and buckler fought the "Italian teacher of offense", Signior Rocco with his two hand sword. Silver relates how Bagger "presently closed with him, and struck up his heels, and cut him over the breech, and trod upon him, and most grievously hurt him under his feet." Which means he charged forward, swept his legs out from under him, slashed his rear, and then stomped on him a few times while he was down. Hutton tells us how in the year 1626, the Marquis de Beuvron and Francois de Montmorency, Comte de Boutteville, the notorious rabid duelist and bully, fought a duel together in which both attacked "each other so furiously that they soon come to such close quarters that their long rapiers are useless. They throw them aside, and, grappling with one another, attempt to bring their daggers into play." In 1671 an affray took place in Montreal, Canada, between Lieutenant de Carion and Ensign de Lormeau. While walking home with his wife, de Lormeau was confronted by de Carion backed by two friends. Provoked into fighting by de Carion, both men drew swords and exchanged blows. De Lormeau was wounded three times, including wounds to the head and arm. Both wrestled briefly before de Carion struck de Lormeau repeatedly on the head with his pommel. They were then separated by some five passing onlookers and both combatants survived. Closing in to strike, to grab, trip, throw, or push the opponent down is seen in countless Renaissance fencing manuals from the cut-and-thrust style swords of Marozzo in 1536 to the slender rapier of Giovanni Lovino in 1580 and that of L'Lange in 1664. Jacob Wallhausen’s 1616 depictions of military combat (armored and unarmored) show much the same. Dr. Sydney Anglo calls this desperate armed or unarmed combat "all-in fighting" as opposed to formal duels with rules, and describes it as: "one other area of personal combat which was taught by masters throughout Europe, and was practiced at every level of the social hierarchy whether the antagonists were clad in defensive armor or not". He adds that, "Even in Spain, where it might be thought that mathematical and philosophical speculation had eliminated such sordid realities, wrestling tricks were still taught by the masters –as well illustrated in early seventeenth-century manuscripts treatises by Pedro de Heredia, cavalry captain and member of the war council of the King of Spain". 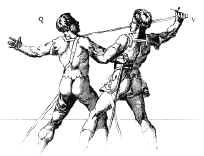 Heredia’s illustrations of rapier include several effective close-in actions that hark back to similar techniques of Marozzo and even Fiore Dei Liberi in 1410. The chronicler of duels, Brantome, tells us of a judicial duel in the mid-1500’s wherein the Baron de Gueerres fought one Fendilles. Having received a terrible thrust in the thigh, the Baron availed himself of his wrestling skills and "closed with his antagonist and bore him to the ground; and there the two lay and struggled". He also relates a sword & dagger duel between the Spanish Captain Alonso de Sotomayor and the knight Bayard. After some figting Sotomayor missed a thrust which Bayard answered by deeply piercing his throat that he could not withdraw his weapon. Sotomayor was still able to grapple with Bayard so that both fell where Bayard then managed to stab Sotomayor in the face with his dagger. Some would still give us the impression today that personal combat in the Renaissance consisted only of cavaliers and courtiers formally dueling each other and apparrently no gentleman or courtier in the period ever fought under any other condition or for any other reason other than affairs of honor. Of course, it must be thoroughly understood that it was the Renaissance aristocracy who were primarily recording accounts of duels and frays and who naturally wrote almost exclusively about combats among their own social class. Naturally, proper duels (illegal or not) were far more interesting to them than everyday fights (by gentry or commoner) which garnered neither reputation nor honor. But the actual evidence from the period suggests a very different character than a conception of simple "honorable" swordplay. John Clements is an authority on historical fencing and one of the world’s foremost practitioners of Medieval and Renaissance fencing. He is a long-time martial-artist who has been studying historical fencing since 1980. He has practiced cut & thrust swordsmanship and rapier fighting for more than eighteen years. John has researched swords and arms in 8 countries and taught sword seminars in 6 countries. Since summer 1997 he has taught public courses and private lessons in Houston. He has authored numerous articles on swords and weapon fighting for several magazines including: Renaissance Magazine, Tactical Knives, Karate International, Histoire' Medievale, L’art de la Guerre, Master at Arms, The Sword, Hammerterz Forum, Hop-Lite, and Sword Forum International. John was also major contributor on historical fencing as well as member of the editorial board to the new Martial Arts of the World encyclopedia from ABC-CLIO Press (October 2001). He has also authored five books including: Medieval Swordsmanship: Illustrated Methods & Techniques (Paladin Press, Nov ’98) and Renaissance Swordsmanship: The Illustrated Use of Rapiers and Cut-and-Thrust Swords (Paladin Press, March '97). John has also been featured twice on The History Channel, and was the creator and a founding member of the original Swordplay Symposium International. In 1982 he founded the Medieval Battling Club. John is the Director of The Association For Renaissance Martial Arts (ARMA), where this article was originally featured.